If you admire bold design, then you have got to love Stuckx. 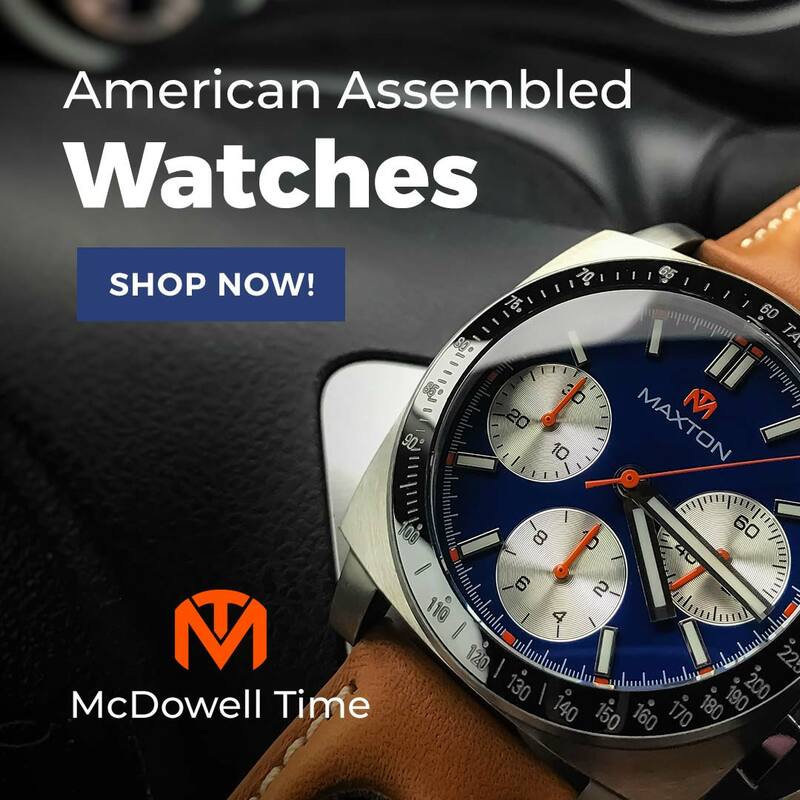 Many micro brands and Kickstarter aspirants proclaim that they will shake up the industry with their groundbreaking watches, only to release products that break wind. Stuckx is not one of these. 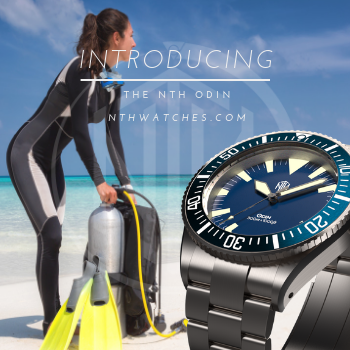 Earlier this year, they announced The RocK, an outrageous diver that is wildly over the top yet compelling thanks to a surprisingly nuanced design. Today, I have a prototype of the other Stuckx release, The Bull, to see if they accomplished the same balance with their audacious race timer. Stuckx offers The Bull in both automatic and quartz versions, both featuring flat sapphire crystals and 200m water resistance. The review sample is powered by a Seiko VK64 MechaQuartz, a two-register hybrid unit that engages a mechanical module for chronograph duty, providing quartz accuracy with precise feel, 1/5th-second sweep, and a crisp snap-back, all in one budget-minded package. The sub dials show seconds at 3 o'clock and elapsed minutes at 9 o'clock. 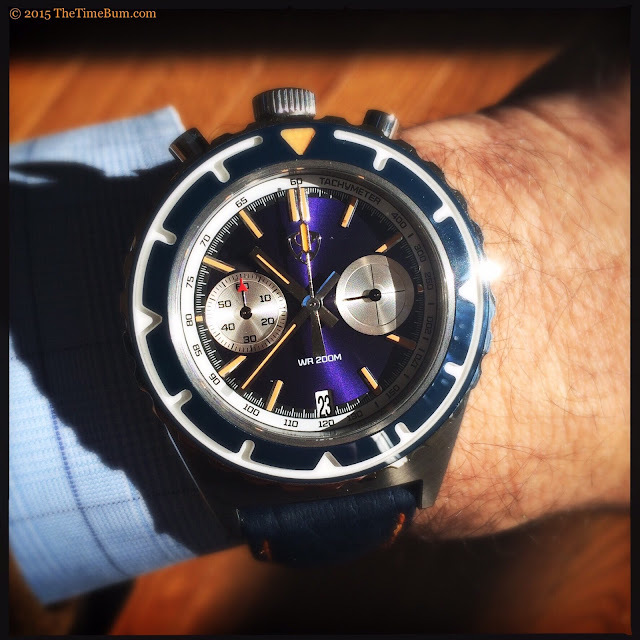 The central second hand runs with the chronograph. A 6 o'clock window reveals the black-on-white date wheel. The watch was inspired by 1970's car culture, so it is fair to say that a little flash was in order, most notably in the case design, which was inspired by an old Breitling design. 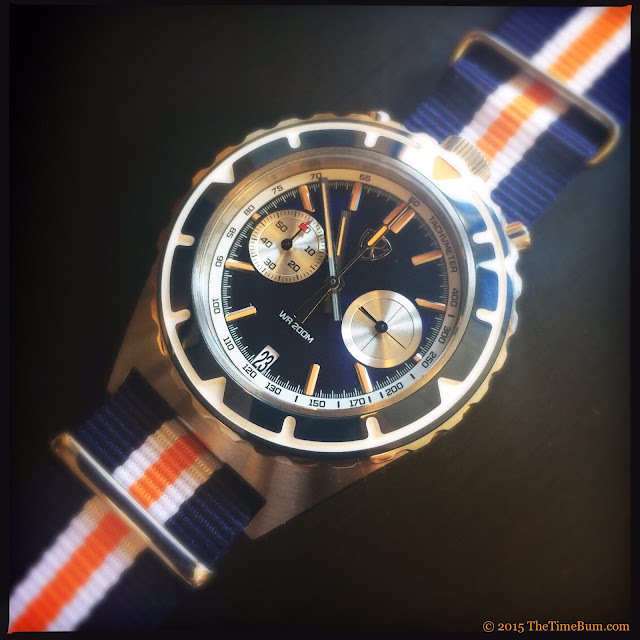 To my budget-minded eye, it recalls bullhead race timers like the Citizen 8110 and Seiko 6138. 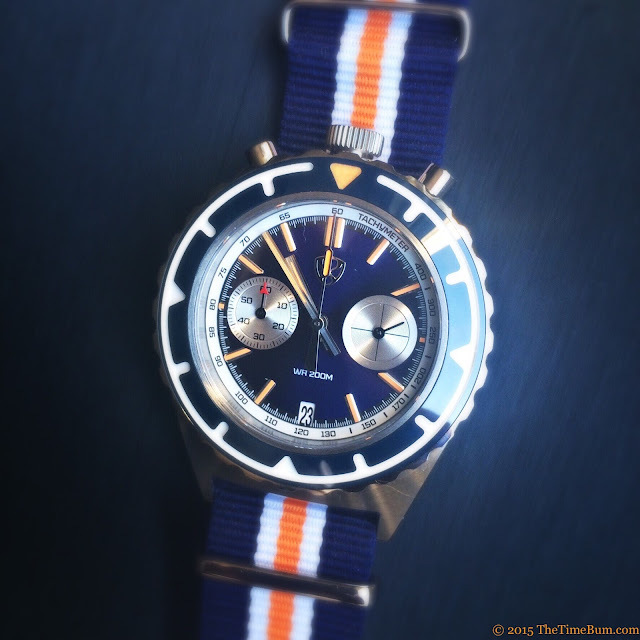 Like those classics, The Bull places the crown and chronograph buttons at the top of the case. Its 42mm asymmetrical case is 16mm thick and lugless at the top, tapering dramatically to conventional, curved lugs at the bottom. This Bull not a small watch by any means, but the arc of the case allows it to sit comfortably, even on my relatively small 6.5" wrist, without being overly top-heavy. The case wears a brushed finish save for the slim, polished, beveled edge encircling the entirety of the case, even inside and between the lugs. It is one of many tasty details on this watch. Given all the action up front, the back is rather plain; just some key specifications engraved around an undecorated case back. Similarly, the prominent screw down crown is unsigned. 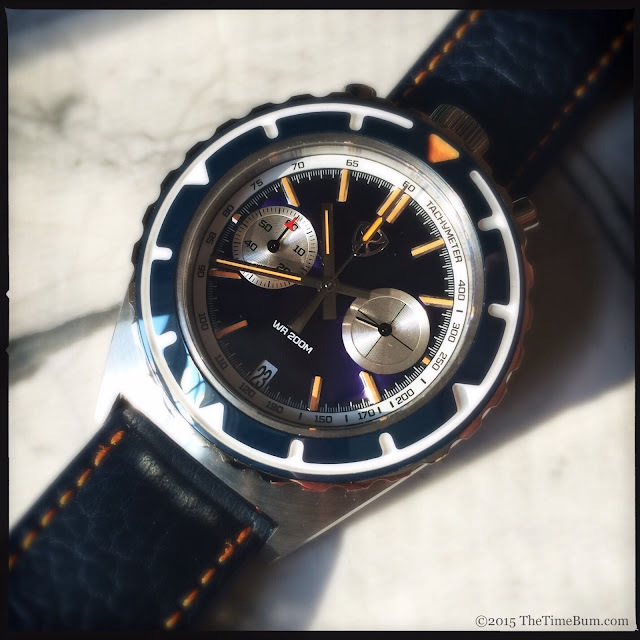 The dial on this Bull is a sun-brushed blue with silver registers, but several other varieties are available including black, "panda", champagne, orange, and brown. 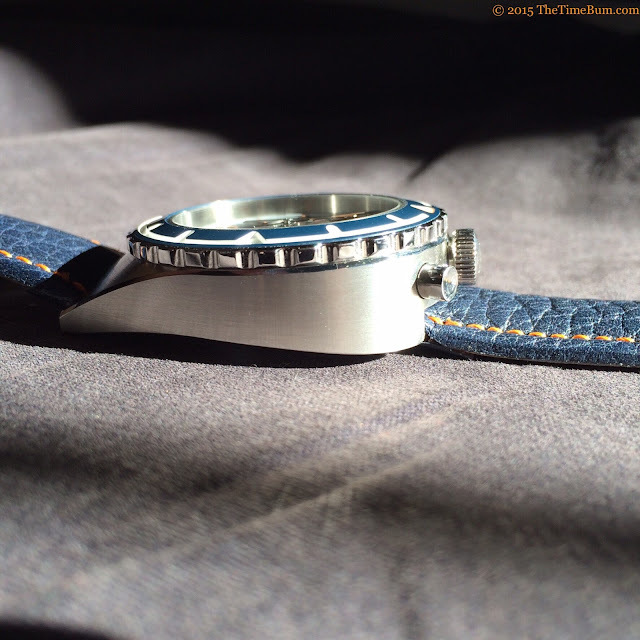 The sample was a dark and lustrous indigo – quite lovely against the contrasting white Tachymetre chapter ring. The hands are polished batons with a channel of orange lume to match that of the stick markers, paddle style second hand, and triangle at the bezel's top center. Interestingly, the small seconds dial has no markers at all. It is a clean and uncluttered layout with only the applied and polished Stuckx shield logo in the upper portion and a simple "WR 200" printed below. 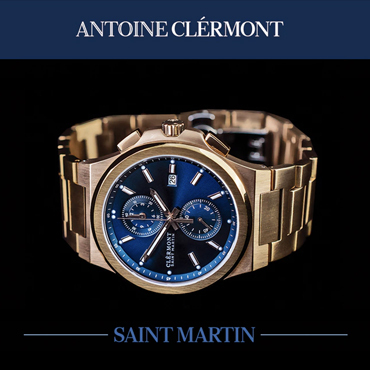 Clever as the dial may be; it is the bezel that commands your attention. Its sculpted ceramic insert is The Bull's signature attraction. The markers have been cut away in a single, sinuous channel, leaving a raised, polished ring. The cutaway is matte finished and painted, in this case, it is white to contrast the dark, shiny blue. An orange triangle marks the top center. It is an arresting effect, perfectly logical and legible, but entirely unexpected. The Bull would have still been an appealing watch with a conventional insert, but the stylized ceramic takes it to the next level. On a practical note, the bezel action is precise, smartly snapping through its cycle. The prototype has a 90 click bezel, but it will be 120 on the final. 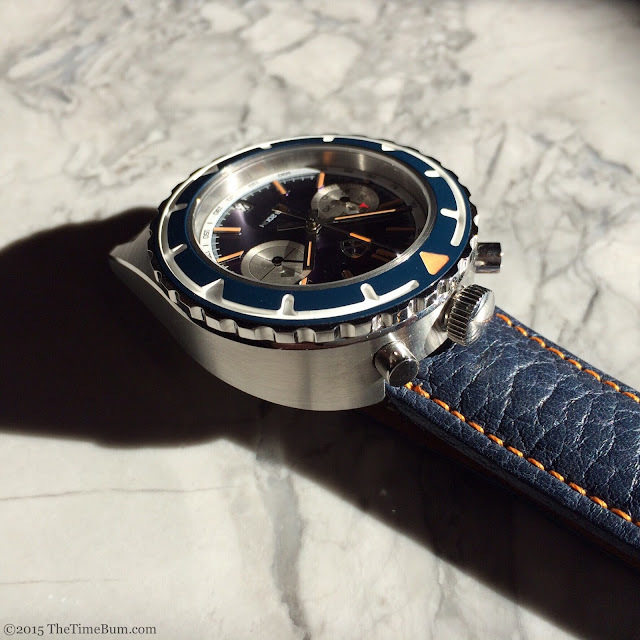 The Bull arrived with four 22mm straps: a two-piece leather, and three nylon NATOs. The padded leather has great color, attractive grain, and bright orange stitching. It looked fantastic on the watch, but as it was an XL, it just flopped awkwardly on my wrist. Production straps will be a standard length. The white and orange NATOs were perfectly nice, but the blue/white/orange regimental blew them away and immediately became my strap of choice. Prototypes have their limitations, and The Bull had its share. 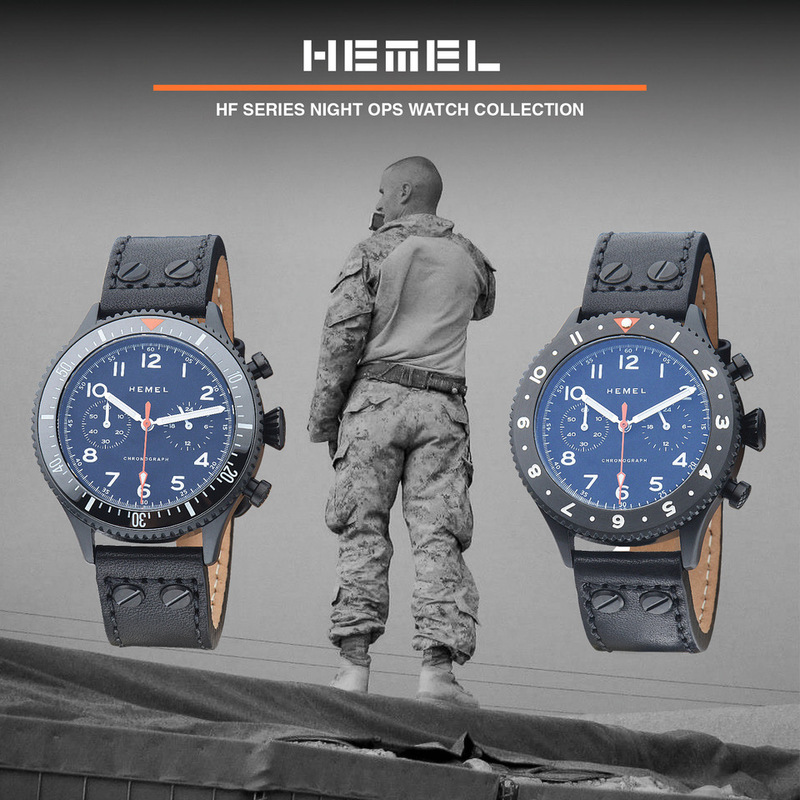 Where production watches will have SuperLuminova, the sample wore a dim substitute. As noted above, the bezel was a few clicks short while the strap was too long. The date wheel was a non-functional dummy. Finally, the second hand was made from an improper material that was too weak to withstand the VK's vigorous reset, so I left it alone and relied on my experience with the same movement in other watches. Even so, the sample displayed a high level of fit and finish that bodes well for the final versions, and the overall design is simply a knockout. True to form, Stuckx has taken an offbeat concept and grounded it with solid design fundamentals. If you were one of the 267 backers who bought The Bull through Kickstarter, you will not be disappointed. If not, then you can still head over to Stuckx.com and order one for €280 ($307 USD). Con: Wedge-shaped case is not for everyone. Sum: Another stunner from Stuckx. The Time Bum approves.